I WILL ALSO INCLUDE THE FULL KING REPORT WHICH ENCOMPASSES ALL THE MAJOR STORIES FOR THE LAST TWO DAYS. THIS TIME BY A STRONG SIZED 3845 CONTRACTS FROM 195,711 UP TO 199,556 DESPITE YESTERDAY’S 1 CENT FALL IN SILVER PRICING AT THE COMEX. TODAY WE ARRIVED CLOSER TO AUGUST’S 2018 RECORD SETTING OPEN INTEREST OF 244,196 CONTRACTS. WE MUST HAVE HAD CONSIDERABLE SHORT COVERING AGAIN TODAY. AND NOW 3.755 MILLION OZ STANDING FOR SILVER IN APRIL. TO GIVE YOU AN IDEA AS TO THE HUGE SUPPLY THIS MONTH IN SILVER: SO FAR THIS MONTH OF MAR: 17.49 MILLION PAPER OZ HAVE MORPHED OVER TO LONDON. THIS REPRESENTS AROUND 4.59% OF ANNUAL GLOBAL PRODUCTION (EX CHINA EX RUSSIA)* JUNE’S 345.43 MILLION OZ IS THE SECOND HIGHEST RECORDED ISSUANCE OF EFP’S AND IT FOLLOWED THE RECORD SET IN APRIL 2018 OF 385.75 MILLION OZ. ACCUMULATION IN YEAR 2019 TO DATE SILVER EFP’S: 590.175 MILLION OZ. RESULT: WE HAD A STRONG SIZED INCREASE IN COMEX OI SILVER COMEX CONTRACTS OF 3845 DESPITE THE 1 CENT LOSS IN SILVER PRICING AT THE COMEX /YESTERDAY..THE CME NOTIFIED US THAT WE HAD A STRONG SIZED EFP ISSUANCE OF 379 CONTRACTS WHICH EXITED OUT OF THE SILVER COMEX AND TRANSFERRED THEIR OI TO LONDON AS FORWARDS. SPECULATORS CONTINUED THEIR INTEREST IN ATTACKING THE SILVER COMEX FOR PHYSICAL SILVER (SEE COMEX DATA) . IN GOLD, THE OPEN INTEREST FELL BY ANOTHER UNBELIEVABLE SIZED 2903 CONTRACTS, TO 442,811 WITH THE FALL IN THE COMEX GOLD PRICE/(A LOSS IN PRICE OF $3.80//YESTERDAY’S TRADING). WE JUST HAD OUR FIFTH STRAIGHT DAY OF AN OPEN INTEREST COLLAPSE DUE TO THE ANTICS OF THE SPREADERS. IT LOOKS LIKE THE SPREADERS LIQUIDATE THEIR CONTRACTS NOT SIMULTANEOUSLY BUT AT DIFFERENT TIMES DURING THE TRADING DAY TO CAUSE THE CASCADE OF PRICING IN OUR PRECIOUS METALS AND THAT IS HOW THEY ALWAYS WIN ON OPTION EXPIRY..THEY ARE SO CROOKED. AT THE END OF THE DAY THEY ELIMINATE THE OTHER HALF OF THE SPREAD TRADE. THE COLLAPSE OF OPEN INTEREST SHOULD END WITH THIS READING AND ADVANCE FROM TUESDAY ON..
APRIL 0 CONTRACTS,JUNE: 4350 CONTRACTS DECEMBER: 0 CONTRACTS, JUNE 2020l 0 CONTRACTS AND ALL OTHER MONTHS ZERO. The NEW COMEX OI for the gold complex rests at 442,811. ALSO REMEMBER THAT THERE WILL BE A DELAY IN THE ISSUANCE OF EFP’S. THE BANKERS REMOVE LONG POSITIONS OF COMEX GOLD IMMEDIATELY. THEN THEY ORCHESTRATE THEIR PRIVATE EFP DEAL WITH THE LONGS AND THAT COULD TAKE AN ADDITIONAL, 48 HRS SO WE GENERALLY DO NOT GET A MATCH WITH RESPECT TO DEPARTING COMEX LONGS AND NEW EFP LONG TRANSFERS. . EVEN THOUGH THE BANKERS ISSUED THESE MONSTROUS EFPS, THE OBLIGATION STILL RESTS WITH THE BANKERS TO SUPPLY METAL BUT IT TRANSFERS THE RISK TO A LONDON BANKER OBLIGATION AND NOT A NEW YORK COMEX OBLIGATION. LONGS RECEIVE A FIAT BONUS TOGETHER WITH A LONG LONDON FORWARD. THUS, BY THESE ACTIONS, THE BANKERS AT THE COMEX HAVE JUST STATED THAT THEY HAVE NO APPRECIABLE METAL!! THIS IS A MASSIVE FRAUD: THEY CANNOT SUPPLY ANY METAL TO OUR COMEX LONGS BUT THEY ARE QUITE WILLING TO SUPPLY MASSIVE NON BACKED GOLD (AND SILVER) PAPER KNOWING THAT THEY HAVE NO METAL TO SATISFY OUR LONGS. LONDON IS NOW SEVERELY BACKWARD IN BOTH GOLD AND SILVER AND WE ARE WITNESSING DELAYS IN ACTUAL DELIVERIES. IN ESSENCE WE HAVE A NET GAIN IN TOTAL CONTRACTS ON THE TWO EXCHANGES OF 1447 CONTRACTS: 2903 OI CONTRACTS DECREASED AT THE COMEX AND 4350 EFP OI CONTRACTS WHICH NAVIGATED OVER TO LONDON. THUS TOTAL OI GAIN OF 1477 CONTRACTS OR 147,700OZ OR 4.5000 TONNES. YESTERDAY WE HAD A FALL IN THE PRICE OF GOLD TO THE TUNE OF $3.80….AND YET WITH THAT, WE HAD A STRONG LOSS IN TONNAGE OF 4.5000 TONNES!!!!!!. 4350 CONTRACTS MOVE TO LONDON AND 2,903 CONTRACTS DECREASED AT THE COMEX. (IN TONNES, THE GAIN IN TOTAL OI EQUATES TO 4.5000 TONNES). ..AND ALL OF THIS DEMAND OCCURRED WITH A FALL IN PRICE OF $3.80 IN YESTERDAY’S TRADING AT THE COMEX!!!!! 1. Today, we had the open interest in SILVER ROSE BY A STRONG SIZED 3845 CONTRACTS from 195,711 UP TO 199,556 AND CLOSER TO THE NEW COMEX RECORD SET LAST IN AUG.2018 AT 244,196 WITH A SILVER PRICE OF $14.78/(AUGUST 22/2018)..THE PREVIOUS RECORD WAS SET ON APRIL 9/2018 AT 243,411 OPEN INTEREST CONTRACTS WITH THE SILVER PRICE AT THAT DAY: $16.53). AND PREVIOUS TO THAT, THE RECORD WAS ESTABLISHED AT: 234,787 CONTRACTS, SET ON APRIL 21.2017 OVER 1 1/3 YEARS AGO. THE PRICE OF SILVER ON THAT DAY: $17.89. AS YOU CAN SEE, WE HAVE RECORD HIGH OPEN INTERESTS IN SILVER ACCOMPANIED BY A CONTINUAL LOWER PRICE WHEN THAT RECORD WAS SET…..
0 CONTRACTS FOR MARCH. 0 CONTRACTS FOR APRIL., 379 FOR MAY AND MARCH 2020: 0 CONTRACTS AND ALL OTHER MONTHS: ZERO. TOTAL EFP ISSUANCE: 379 CONTRACTS. EFP’S GIVE OUR COMEX LONGS A FIAT BONUS PLUS A DELIVERABLE PRODUCT OVER IN LONDON. IF WE TAKE THE OI GAIN AT THE COMEX OF 3845 CONTRACTS TO THE 379 OI TRANSFERRED TO LONDON THROUGH EFP’S, WE OBTAIN A CONSIDERABLE GAIN OF 4427 OPEN INTEREST CONTRACTS. THUS IN OUNCES, THE GAIN ON THE TWO EXCHANGES: 21.125 MILLION OZ!!! AND YET WE ALSO HAVE A STRONG DEMAND FOR PHYSICAL AS WE WITNESSED A FINAL STANDING OF GREATER THAN 30 MILLION OZ FOR JULY, A STRONG 6.065 MILLION OZ FOR AUGUST.. A HUGE 39.505 MILLION OZ STANDING FOR SILVER IN SEPTEMBER… OVER 2 million OZ STANDING FOR THE NON ACTIVE MONTH OF OCTOBER., 7.440 MILLION OZ FINALLY STANDING IN NOVEMBER. 21.925 MILLION OZ STANDING IN DECEMBER , 5.845 MILLION OZ STANDING IN JANUARY. 2.955 MILLION OZ STANDING IN FEBRUARY, 27.120 MILLION OZ FOR MARCH. AND NOW 3.755 MILLION OZ FOR APRIL. RESULT: A STRONG SIZED INCREASE IN SILVER OI AT THE COMEX DESPITE THE 1 CENT FALL IN PRICING THAT SILVER UNDERTOOK IN PRICING// YESTERDAY. WE ALSO HAD A STRONG SIZED 379 EFP’S ISSUED TRANSFERRING COMEX LONGS OVER TO LONDON. TOGETHER WITH THE STRONG SIZED AMOUNT OF SILVER OUNCES STANDING FOR THIS MONTH, DEMAND FOR PHYSICAL SILVER CONTINUES TO INTENSIFY AS WE WITNESS SEVERE BACKWARDATION IN SILVER IN LONDON. TOTAL EFP ISSUANCE: 4350 CONTRACTS. ON A NET BASIS IN OPEN INTEREST WE GAINED THE FOLLOWING TODAY ON OUR TWO EXCHANGES: 1477 TOTAL CONTRACTS IN THAT 4350 LONGS WERE TRANSFERRED AS FORWARDS TO LONDON AND WE LOST AN CONSIDERABLE SIZED 2903 COMEX CONTRACTS. NET LOSS ON THE TWO EXCHANGES ::1447 contracts OR 147700 OZ OR 4.50 TONNES. We are now in the active contract month of APRIL and here the open interest stands at 2454 contracts, having lost 356 contracts. We had 823 notices filed upon yesterday, so we GAINED 467 contracts or an additional 46,700 oz will stand as these guys REFUSED TO morph into London based forwards as well as NEGATING a fiat bonus. THE GOLD COMEX IS VOID OF GOLD. The next non active delivery month after APRIL is the NON active delivery month is MAY and here the OI GAINED 111 contracts UP to 2125 contracts. The next contract month after May is June and it is an active month. Here the open interest FELL by 2791 contracts DOWN to 328,403 contracts. WE ARE NOW INTO THE NON ACTIVE DELIVERY MONTH OF APRIL AND THE OPEN INTEREST IN THIS FRONT MONTH RESTS AT 197 CONTRACTS FOR A LOSS OF 375 CONTRACTS ON THE DAY. WE HAD 413 NOTICES SERVED UP YESTERDAY, SO WE GAINED 38 CONTRACTS OR AN ADDITIONAL 190,000 OZ OF SILVER WILL STAND AT THE COMEX AS THEY REFUSED TO MORPH INTO LONDON BASED FORWARDS AS WELL AS NEGATING A FIAT BONUS. AFTER APRIL, WE HAVE THE ACTIVE DELIVERY MONTH OF MAY AND HERE THE OI FELL BY 272 CONTRACTS DOWN TO 133,177. CONTRACTS.. THE NEXT MONTH OF JUNE ADDED ONE CONTRACT TO TOTAL 2. AFTER JUNE, THE VERY BIG DELIVERY MONTH OF JULY HAD A GAIN OF 4073 CONTRACTS UP TO 39,310 CONTRACTS. ON A NET BASIS WE GAINED A STRONG 4224 SILVER OPEN INTEREST CONTRACTS AS WE OBTAINED A 4224 CONTRACT GAIN AT THE COMEX COMBINING WITH THE ADDITION OF 379 OI CONTRACTS NAVIGATING OVER TO LONDON. inventory movements not given today by the CME as they cannot balance any of the crooked data!! No of notices served (2883 x 100 oz) + (2454)OI for the front month minus the number of notices served upon today (1103 x 100 oz )which equals 443,400oz standing OR 13.79 TONNES in this active delivery month of APRIL. To calculate the number of silver ounces that will stand for delivery in APRIL, we take the total number of notices filed for the month so far at 675 x 5,000 oz = 3,375,000 oz to which we add the difference between the open interest for the front month of APRIL. (197) and the number of notices served upon today (121 x 5000 oz) equals the number of ounces standing. Thus the INITIAL standings for silver for the APRIL/2019 contract month:675(notices served so far)x 5000 oz + OI for front month of APRIL( 197) -number of notices served upon today (121)x 5000 oz equals 3,755,000 oz of silver standing for the APRIL contract month. This is a strong number of oz standing for an off delivery month. We gained 38 contracts or an additional 190,000 oz will stand at the comex as these guys refused to morph into London based forwards as well as negating a fiat bonus. *LAST 470 TRADING DAYS: A NET 0.03TONNES HAVE NOW BEEN LOST INTO THE GLD INVENTORY. I will be delighted to answer your questions here if we have any time left, or at CPowell@GATA.org. If you can’t find any document I have mentioned today, just let me know and I’ll try to locate it for you. 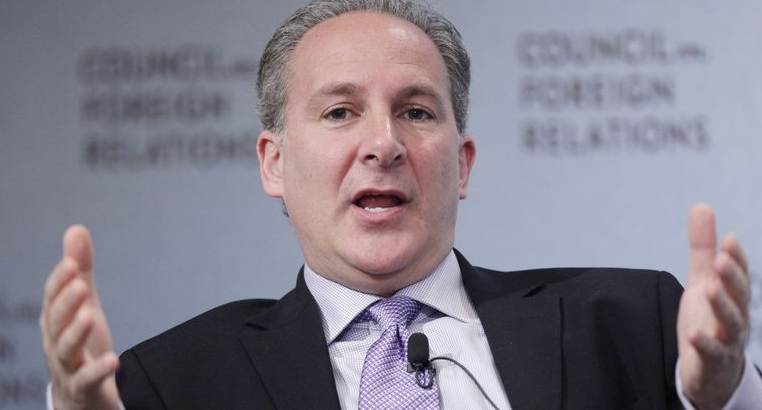 In his most recent media appearance, Peter Schiff blasts the mainstream financial media and Fed policies, which he believes to be inflating the “biggest bubble yet”. Schiff appeared on the Quoth the Raven Podcast on Sunday and spent an hour and a half explaining his case as to why the United States is heading to a currency crisis. Schiff led off talking about why he doesn’t get any mainstream financial media attention anymore, partly responding to recent commentsby CNBC contributor Guy Adami that Schiff was “bad for TV”. He continues the interview, explaining why he suggests his clients constantly keep 5-10% of their capital in gold. When asked about how he personally invests versus how he advises his clients, he explains why he is the most overweight gold miner stocks that he’s ever been. Schiff also says we will need a gold standard again, which he thinks is inevitable, much to the dispassion of the government. “When they choose gold, which is the right choice, it’ll only be because they’ve exhausted everything else that wouldn’t work. When they admit we need a gold standard, the party’s over”. “Gold keeps government honest, which is why the government doesn’t want it,” he said. 30 SNB (Swiss National Bank) still intervening again in the markets driving down the SF. It is not working: USA/SF this morning 0.9951 as the Swiss Franc is still rising against most currencies. Euro vs SF is 1.1176 well above the floor set by the Swiss Finance Minister. Thomas Jordan, chief of the Swiss National Bank continues to purchase euros trying to lower value of the Swiss Franc. After several of the largest third-party sellers of Apple products in China cut prices for the latest batch of iPhones, as well as other Apple products, it appears the consumer tech giant has finally made good on its promise to cut prices for certain foreign markets impacted by the strong dollar. CNBC reports that Apple has cut prices by as much as 6% for several of its most important products on its official Chinese online store. iPhones, iPads, laptops and AirPods have been affected by the cuts. 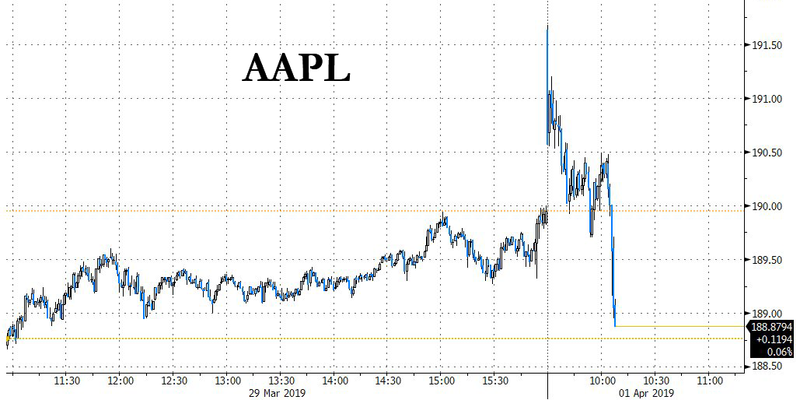 The cuts are hardly a surprise: CEO Tim Cook said back in January that the notoriously discount-resistant Apple would lower prices for some of its products in markets that had been impacted by a strengthening dollar. The Chinese yuan has weakened against the dollar over the past year as the US-China trade war has taken its toll on the exchange-rate. Per Apple’s customer service, customers who have bought any of these products in China within the past two weeks can receive a refund for the difference in the price. Commenting on recent gyrations in the Turkish currency, Rabobank’s Michael Every writes that the lira ended Monday’s volatile session on the firm footing appreciating more than 1% versus the dollar as the market continued to digest the outcome of local elections held on Sunday and tried to assess potential implications of Turkey’s biggest cities voting against President Erdogan’s AKP candidates. Well, that’s precisely what happened on Tuesday, when the Turkish lira’s overnight funding costs tumbled once again as it has become prohibitive difficult for the central bank to continue its vendetta against the shorts, with the rate plunging from over 300% to just over 18%, below levels seen during the credit crunch, and in fact below the central bank’s prevailing rate corridor. As a reminder, last week the overnight swap rate gyrated wildly as a result of measures designed to curb short-sellers before this weekend’s local elections drove it to a high of more than 1,300% as liquidity in the offshore market evaporated. 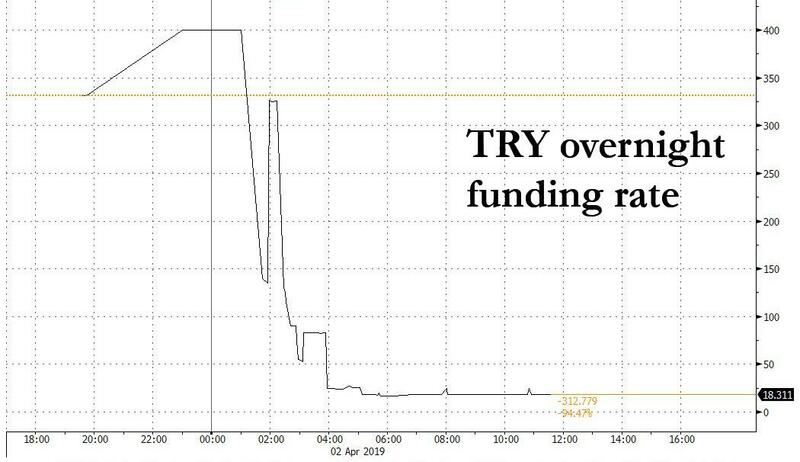 As a result, with local banks keeping a lid on lira funding, foreign investors were forced to access the currency by selling holdings of Turkish bonds and equities, resulting in a crash in local capital markets. 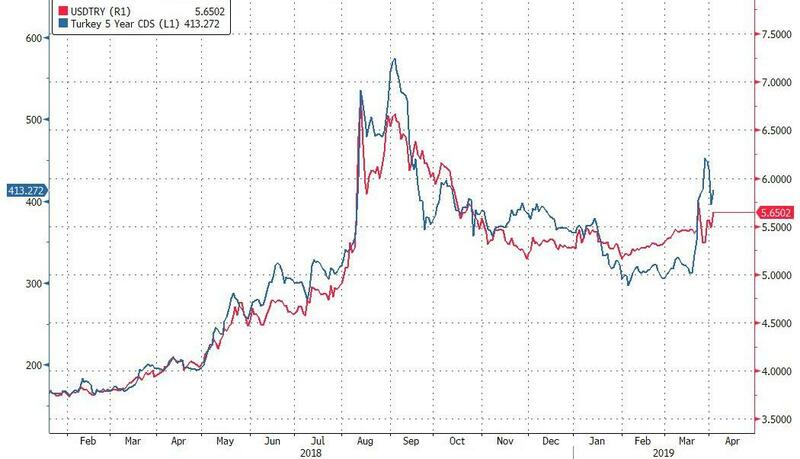 Of course, as discussed before, Erdogan’s play to punish lira shorts cut both ways, as the swap market is one of the biggest sources of Turkish lira funding for money managers trading the nation’s assets and the squeeze didn’t just cripple investors trying to bet against the currency, but also those who had sold dollars and bought liras. That’s because many of them had then lent out the local currency via short-term swaps to benefit from a juicy interest rate, then suddenly found themselves unable to get the funding needed to reverse the trades. As a result, last week’s punishing short squeeze ended up hurting longs just as much as longs, but worst of all, it has crippled foreign investor confidence in the country’s capital markets, which is a major problem for Turkey which for years has been overly reliant on offshore capital to fund its current account gap. 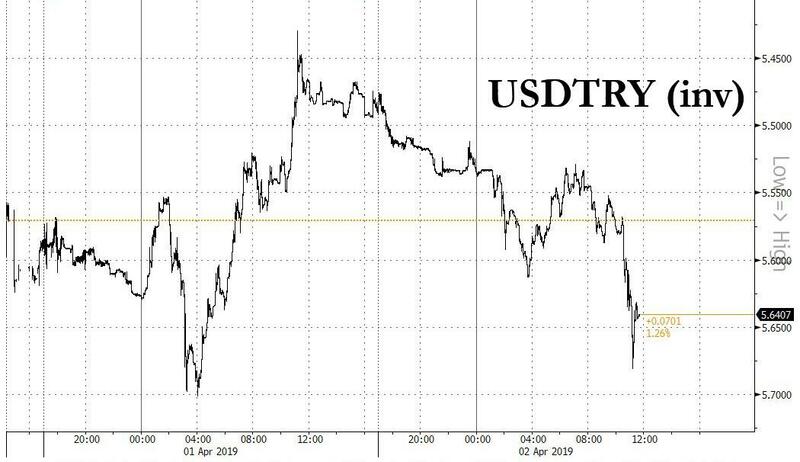 As a reminder, two weeks ago, the most severe bout of market turmoil since Turkey’s August crisis was triggered after a plunge in central bank reserves and a recommendation to short the currency by JPMorgan sent the lira down more than 5%. As Bloomberg wrote at the time, that raised concerns that the money that had poured Turkey to take advantage of the central bank’s 24% benchmark rate would flee. In any case, it appears that Erdogan’s experiment in currency micro management has ended with a thud, and after spooking shorts, they were back with a vengeance on Tuesday, then the Turkish lira tumbled more than 3% to session low of 5.6806 before fractionally trimming its drop. … which while quite bad, and in line with JPMorgan’s infamous 5.90 USDTRY reco, is still a ways away from the recent TD recent price target of north of 7.00. 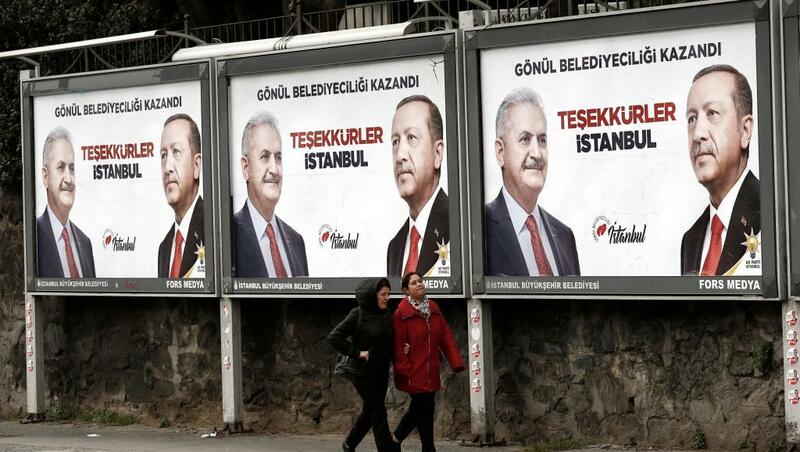 It’s official, or maybe not quite — as perhaps predictably the AK party plans to challenge the stunning defeat: Erdogan’s party has lost Turkey’s three largest cities, Istanbul, Ankara and Izmir, to the opposition Republican People’s Party, or CHP. The final results now with 100% of the ballots counted as reported by the semiofficial Anadolu news agency put opposition candidate for mayor of Istanbul, Ekrem Imamoglu, at 48.79%, barely inching out rival AKP candidate Binali Yildrim’s 48.51%. And in the capital of Ankara, CHP’s Mansur Yavas won with 50.93% of the vote, compared to AKP’s Mehmet Ozhaseki’s 47.12%. Chaos erupted late on Sunday when President Erdogan’s ruling AKP party was looking certain to lose control of the capital, Ankara, while both AKP and the opposition CHP party claimed victory in Istanbul in the culmination of a critical municipal vote that is testing the popularity of Turkey’s executive president. 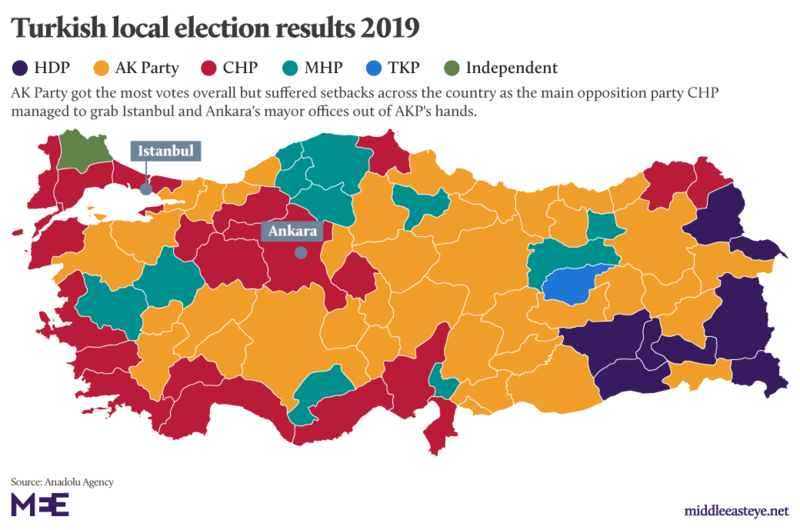 As reported by various news wires, preliminary results showed the opposition flipping the capital Ankara and surrounding areas from Erdogan’s alliance, and taking control of some of Turkey’s key Mediterranean coastal cities. In a stunning (or perhaps not, after all this is Turkey) to what appears to be an extreme close vote, even before the final figures were announced, Erdogan’s ally and former prime minister Binali Yildirim said he won the race in Istanbul, Turkey’s commercial hub, a claim rejected by the opposition, which said it won. Early MONDAY morning USA 10 year bond yield: 2.44% !!! UP 4 IN POINTS from FRIDAY’S night in basis points and it is trading WELL ABOVE resistance at 2.27-2.32%. The 30 yr bond yield 2.85 UP 4 IN BASIS POINTS from FRIDAY night. USA dollar index early MONDAY morning: 97.11 DOWN 17 CENT(S) from FRIDAY’s close. the Italian 10 yr bond yield is trading 139 points HIGHER than Spain. USA/JAPANESE YEN:111.37 UP .546 (YEN DOWN 55 BASIS POINTS/.. Economically sensitive stocks (transports, materials, commodities and industrials) rallied sharply on short covering and new buying. Bonds declined smartly. While bonds are forecasting recession, US stocks are signaling a new economic up leg is nigh. Though most people know that stocks have soared in Q1, few realize that gasoline prices have rallied even more sharply. Like stocks, gasoline bottomed on Christmas Eve (144.27 May contract). Yesterday, May WTI Oil hit 190.43. This is a 32% rally. While the fin media and Street barkers herald inflating stock prices, they are ignoring the deleterious effects of surging gasoline and commodity prices. There is a huge political tradeoff in these dynamics. The average American will become irate with surging gas prices, regardless of how high stocks rise. China’s manufacturing PMI uptick induced most of the known world to ignore unexpectedly ugly US February retail sales. The headline line number showed a 0.2% m/m decline; +0.2% was consensus. Ex-Autos declined 0.4%; +0.3% was consensus. Ex-Autos & Gas tumbled 0.6%; +0.3% was expected. Building materials tumbled 4.4%, the biggest decline since 2012. Food & Beverage declined 1.2%, the biggest drop since 2009. Gasoline sales, due to surging prices, jumped 1%. Gasoline inflation kept the headline retail sales number from being worse. A huge mitigating factor in the February Retail Sales Report: January was revised to 0.7% from 0.2%. Anyone paying attention knew something was askew when Wal-Mart and others reported great January sales but the US beancounters reported the opposite. Markit’s March US Manufacturing PMI fell 0.1 to 52.4. 52.5 was expected. ISM’s March Manufacturing PMI increased to 55.3 from 52.3; 52.5 was expected. February Construction Spending for February increased 1.0%; -0.2% was consensus. January was revised to 2.5% from 1.3%. A few weeks ago, we noted that since the Crisis of 2008-2009, there has been a tendency for unexpectedly soft economic data to appear during severe winter months. Several Polar Vortexes and snow storms occurred during these periods. It appears there might be a problem with seasonal adjustments. Nevertheless, soft winter data this decade have yielded to surprisingly strong spring data. If this occurs again, Powell and his buds will have a huge problem, not to mention the accompanying ridicule. How could Powell and his buds not be aware of the trend this decade that shows soft Q1 economic data due to severe weather tend are regularly followed by solid to strong Q2 economic data? Markit’s Mar Eurozone Manufacturing PMI fell to 47.5 from 47.6. Germany’s Manf PMI dropped to 47.1 from 44.7. Unchanged was expected. Of course, China’s PMI obscured this ugly news, too. The DJTA soared 2.4%. It was the strongest major index despite US flights being grounded due to a ‘mass systems outage’ early Monday morning. The problem was resolved before the NYSE open. Adam Crisafulli, an executive director at J.P. Morgan, says the S&P 500 consensus earnings estimate for 2020 ticked down to about $181 to $182 per share in recent weeks from about $185. When will higher bond yields impact stocks? UK Parliament rejects all Brexit ‘indicative votes’ to find way forward – Last time, all eight ideas were voted down, a second round has failed yet again to find a majority for the UK’s path out of the EU. Today – The S&P 500 Index experienced a positive Golden Cross (50-DMA above 200-DMA). Normally, after a Monday rally and the end of upward seasonal bias, a Turnaround Tuesday to the downside would be a high probability. However, the hope of an economic rebound from one Chinese data point might force enough defense asset allocators out of their positions to keep the equity rally and bond decline going. PS – Somewhere, Ben Bernanke is dreaming about ‘green shoots’. The S&P 500 Index is 2.57% from its intraday all-time high of 2940.91. The index is 2.2% from its closing high of 2830.75. We have noted that April is a great month for making an important top after a Q1 surge. All systems are ‘Go’ for a shot at the all-time highs. In coming days, traders and wise guys will try to shoot for the number in a pump & dump scheme. The schemers hope that a new high will induce manic short covering and momentum buying. The blackout period for stock buybacks ahead of Q1 earnings results might be a consideration for astute traders. ESMs are -2.75 as we write in quiet trading. Did you know that Comey’s daughter has been an assistant US Attorney for the SDNY since 2015? The Swamp is much deeper than we thought! This raises enormous conflict of interest issues at the least and possibly something more sinister given reports of the SDNY’s quest to get Trump. George Papadopoulos @GeorgePapa19:To be clear: a woman in London, who was the FBI’s legal attaché in the U.K., and had a personal relationship to Bob Mueller after 9/11, encouraged me to meet Joseph Mifsud in Rome in March 2016 and introduced Bruce Ohr to the top U.K. prosecutor 4 days before the Trump tower mtg. Ex-DJT Nat’l Security Advisor @SebGorka: This is the KEY to #RussiaGate. @JohnBrennan used British Intelligence- GCHQ – to get around Constitutional protections and illegally spy on @realDonaldTrump and his team. ESMs declined steadily during Asian trading and through early European trading. After hitting a bottom of 2864.50 at 3:44 ET, ESMs rallied briskly to 2873.75 at 8:24 ET. After peaking about an hour before the NYSE open, ESMs declined until the NYSE open. They then plunged. Apparently the ESM rally during the usual window of manipulation was just another pump & dump scheme or an attempt to orchestrate a higher NYSE open than warranted. Traders bought the opening plunge on the NYSE. Unfortunately for conditioned traders, ESMs fell to a new regular session low within 5 minutes of the modest bounce. But traders kept buying, a tug-of-war developed. The session was only ten minutes old, but the battle lines were drawn. A possible reason for the ESM action appeared: The PBoC said it would seek a police investigate into the circulation of false information that it had announced a RRR cut. Who would do such a thing? Putin? After forcing ESMs into positive territory near the end of the first hour of trading, ESMs and stocks tumbled until a rally materialized 15 minutes before the European close. The ensuing contrived rally lasted 45 minutes. After a midday retreat, the usual suspects orchestrated, or forced, the afternoon rally. Trump abetted the rally with more BS/verbal intervention, stating for the umpteenth time that trade talks with China are going well. ESMs topped ten minutes before the NYSE close, equaling the full session high that appeared well before the NYSE open. ESMs and stocks then declined into the close. The ESM decline persisted until the CME session ended, 15 minutes after the NYSE close. Barring news, when ESMs fall smartly immediately after the close, it means that too many traders got caught long and could not liquidate near the close. The DJIA declined for the day because Walgreens declined 12.81% due to ugly earnings and a lower earnings guidance to flat from a previous forecast of 7% to 12% growth for 2019. US Durable Goods Orders for Feb fell 1.6% due to a 31.1% tumbled in nondefense aircraft and parts. A decline of 1.8% was expected. Nondefense Ex-Air Orders declined 0.1%; +0.1% was expected. Ex-Secret Service agent @dbongino: Everything that’s broken, or is breaking, is either run by government or has a heavy government foot print on it: public education, healthcare, student loans, Social Security, pensions, federal, state and local budgets. Government IS the cause of your problems. Today – Traders and wise guys tried to jam ESMs and stocks higher on Tuesday, but negative news (see above) inhibited the effort. It was disappointing that there was no significant follow through after Monday’s manic rally. Barring overnight news, the probability is high that there will be another tug-of-war between those that have been rewarded by upward manipulation and sellers. If an uptick in real selling appears, it should tip the scales to the downside. If a US-China trade deal is announced, be prepared to the formation of a significant equity top.